High Power rockets for K and higher engines. These are the largest models, for more experienced modelers. An High Power Level 3 certification is required for launch. For K motors and up There are 3 products. A massive Level-3 rocket kit.The Frenzy Massive is an all-fiberglass, huge high power rocket designed for 98mm motors and Level-3 flights. The giant of Madcow production.The 8-inch (20 cm) DX3 is a large all-fiberglass high-power Level-3 rocket designed for 98 mm motors. The famous Cold War rocket you can launch harmlessly. 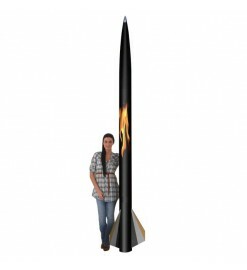 A beautiful all fiberglass rocket kit for experienced fliers. High power flights with I to K motors.